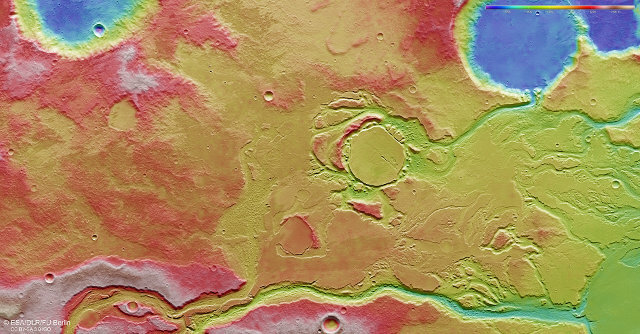 The analysis of photographs of the region of Mars known as Mangala Valles led to the conclusion that it was volcanic activity that generated the heat that caused catastrophic floods through the melting of glaciers. The photographs were taken by ESA’s Mars Express space probe on July 12, 2015 just south of the valley known as Minio Vallis, a part of the canal system of Mangala Valles, near the equator in the western hemisphere of the red planet. The plateau Mangala Valles is part of is known as Tharsis and is the home of ancient volcanoes, including Olympus Mons, the biggest in the solar system with its 22 kilometers (almost 13.7 miles) of height. The name comes from the word Mangala which is the Sanskrit for Mars. During the Hesperian period, between 3.7 and 3.1 billion years ago, there was a strong volcanic activity on Mars which caused considerable tectonic consequences. Among them there was the formation of a rift valley (graben) called Mangala Fossae in Mangala Valles. Scientists think the source of running water in the area is related to the formation of Mangala Fossae. An increase in volcanic activity could have caused the melting of underground ice and consequently the formation of channels, dug by water become liquid. The large crater in the center of the images looks different, filled with water and sediment with a later erosion. The crater at the top right of the image, which has a diameter of about 28 kilometers (about 17.4 miles), was filled with water through a channel that transported it. At the bottom right of the image there’s a part of another crater with similar characteristics. The lower edge of the image is crossed by a deep channel that shows many traces of those ancient events. The chaotic ground suggests that the region had also underground ice with several episodes of melting and floods. 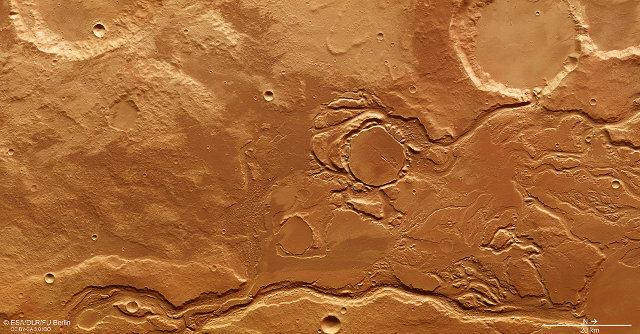 The photographs taken by the High Resolution Stereo Camera (HRSC) of the Mars Express space probe are helping to reconstruct the geological history of Mars, in this case of the ​​Mangala Valles area. After the recent results obtained by NASA on the ancient lakes existed on the red planet, this is another piece of the big puzzle of the history of a world that used to be in many ways similar to Earth.